Discover “how to lose weight” while you’re having the time of your life. If your search for a trusted diet plan to lose weight lead you here – congratulations, you have come to the right place. Party Girl Diet author Aprilanne Hurley, SFN, CLFC is a Certified Specialist in Fitness Nutrition, Certified Lifestyle Fitness Coach and a nutrition professional you can trust will not try to “sell” you on food products or recipes made with less that 100% healthy ingredients. In fact, The Party Girl Diet™ is based on consuming a variety of delicious foods as close to their most natural form as possible. This is turn allows you to eat more food (including treats like dark chocolate and red wine for instance) – which is explained in the book in great detail. Party Girl Diet™ author Aprilanne Hurley appears live on Good Day Sacramento with host Marianne McClary for a fun and informative look at how to get a flat belly AND enjoy what you eat with whole foods AND lose weight while you ‘re having the time of your life. In addition to revealing how to lose weight with a healthy, sustainable lifestyle outlined in The Party Girl Diet, Hurley emphasizes that the secret to weight maintenance is creating a balanced life by eating the right amount of food and getting the right amount of exercise. Hurley is also a huge supporter of eating certain natural foods containing probiotics and prebiotics to help aid digestion and promote a flat belly. Hurley recommends getting your probiotics and prebiotics from the foods you eat over taking an oral supplement. The Good Day Sacramento Party Girl Diet segment below covers foods that aid in digestion, debuts Hurley’s Signature Fresh Flat-Belly Salsa Recipe, and demonstrates how to make The Party Girl Diet’s famous “Morning After Mocktail” as a natural and gentle detoxifying pick me up. The Party Girl Diet enjoys cult status in books with a history of ranking in the Top 5 books on Amazon’s Best Sellers List for Kindle books in Weight Maintenance and Weight Loss, and #2 in Cooking, Food & Wine – Natural Foods on Amazon’s Best Seller list. Special thanks to Good Day Sacramento cast & crew for a super fun day in Sacramento, CA. This antioxidant packed elixir has been formulated to replace some of the vitamins lost through alcohol consumption while providing gentle detoxifying benefits. 2. Pour all of the ingredients above into cocktail shaker and shake vigorously. 3. Serve it straight up! Strain contents of shaker into bar-ware for an fun presentation…Cheers! 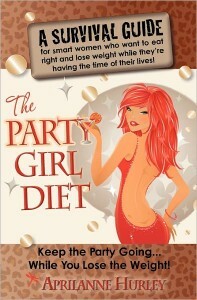 Order your copy of The Party Girl Diet Book or specially priced Kindle Edition on Amazon.com today.